The NHA is always working to improve their educational offerings. In addition to actively creating and implementing new programs, the NHA occasionally offers unique programs tailored to specific groups. This is a sampling of the programs that we have offered in the past. 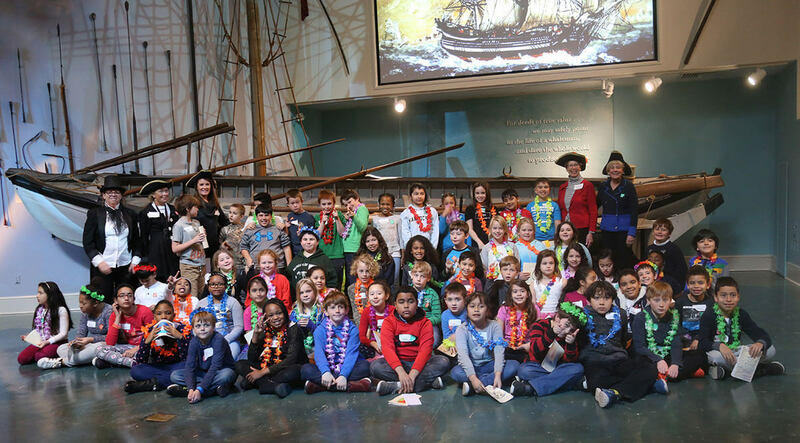 A collaborative partnership with the Nantucket Elementary School (NES) invites every NES third grader to sign onto a whale ship and sail away to exotic places for one night every fall. This transformative experience provides the opportunity to learn through stories and hands-on activities just what it meant to be a whaler in old Nantucket. 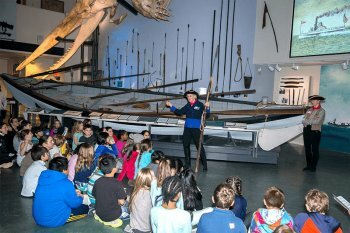 Students are assigned to one of three whaleship crews, and with the aid of their Captain (a skilled and engaging NHA Interpreter) they learn what propelled Nantucketers to sea. Along the way, they meet historic characters, explore the different cultures that Nantucketers encountered on their voyages, and even spot some whales! Before falling asleep under the belly of the whale skeleton, they return to the home port, determine how much money they made, and take a photo with their crew to preserve the memory. 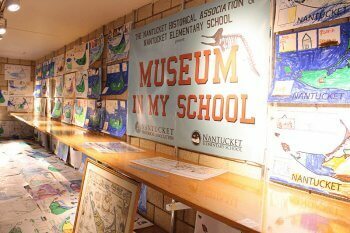 In 2012, the NHA began an ongoing collaboration with the Nantucket Elementary School to bring artifacts and stories into the classrooms. Each month of the school year, education staff visits one grade at the school. NHA staff visits each classroom twice, bringing along artifacts and images, and students create their own artifact-based art or writing project. These projects, along with the NHA’s own artifacts and images, are then placed on display in the school’s showcase, creating a museum in the school. Students learn about specific topics in Nantucket history as well as the role of museums and the proper care of historical artifacts, all within a Massachusetts Curriculum Frameworks-based model. In 2014, the NHA developed a new overnight experience for the Nantucket New School. 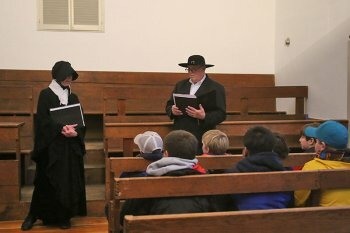 Fourth grade students travel back in time and tour downtown Nantucket, meeting historic figures along the way, before returning to the Whaling Museum to learn about the whaling industry, the Hadwen & Barney Oil & Candle Factory, and the many exotic locations to which whalers traveled. The night culminates in a Nantucket history trivia competition and falling asleep underneath the 46-foot whale skeleton. To inquire about the opportunity to schedule a unique school or youth program, contact the Education Department at (508) 228-1894, ext. 123 or via email at via email at education@nha.org. Unique educational opportunities are subject to availability. Prices vary based on program, resources, and rental fees.